Khairatabad Ganesh, also known as Khairtabad Maha Ganapati, Hyderabad, is the most popular Ganesha idol in India. For Ganesh Chaturthi 2010, the theme of Khairatabad Maha Ganesh is the universal peace (Vishwa Shanti) and it will be going green. The organizers are taking steps to make it eco-friendly Ganesh idol. They were performed Bhoomi Pooja on June 22, 2010, for the initiation of the construction works of Maha Ganapathi for Ganesh Chaturthi 2010 (Vinayaka Chavithi). Reportedly, the height of Khairatabad Ganesha idol in 2010 may cross the last year’s height and may reach up to 48 feet. Khairtabad Ganesh idol is also referred to as Mammoth Ganesh idol. 2010 Ganesha Chaturthi festival is the 55th year of celebrations for Khairthabad Ganesh Utsava committee. For Khairtabad Ganesh idol 2010, the designers are planning to make ‘Pushpak Vinayaka’. Mahaganapati sits under the five-headed snake’s hood on Pushpak Vimana with Abhaya mudra. 101 kgs Laddu, made in Kakinada, will be kept in the hand of Maha Ganapati. Beside Maha Ganapati the two concepts may be: Parashurama slaying his mother and the concept of Goddess Gandi Maisamma (the local Goddess). The official website of Khairtabad Ganesh will upload the theme and the image of the Mammoth Ganesh idol 2010 shortly. Hyderabad Metro Development Authority (HMDA) has been making special arrangements for Khairatabad Ganesh immersion. HMDA is offering subsidies on price and facilities for eco-friendly Ganesh idols in 2010. It is to note that due to the drought in Andhra Pradesh and surrounding areas in 2009, Khairatabad Ganesh Utsav Committee has made Matsya Ganesh Mammoth idol of 45 feet in 2009. You can also watch variety of Ganesha idols made across Andhra Pradesh. 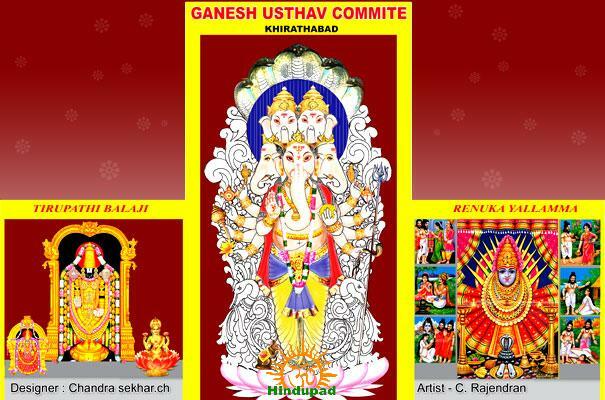 Image source: Official website of Khairtabad Ganesh Utsava Committee. To : The organising committee of the Maha Ganesh at Khairtabad. I wonder it would be in the books of records you are establishing but at the same time you are spending lot of money for only just 10 days, I urge the organizing committee members to re think before spending huge amounts and transfer the same to the welfare activities to the poorest in the name of Ganesh and try to minimize the size of the Idol, as it is being done in Mumbai etc., Welfare activities should be encouraged more rather than simply dumping money in the Hussain Sagar lake.